When and how do I use the © copyright symbol on my web page? If your copy is sparky enough to win new customers, it has value. And that makes it worth stealing. We know this because one of our copywriting clients (a driving school) had its home-page copy stolen by five other driving schools. But that’s another story. 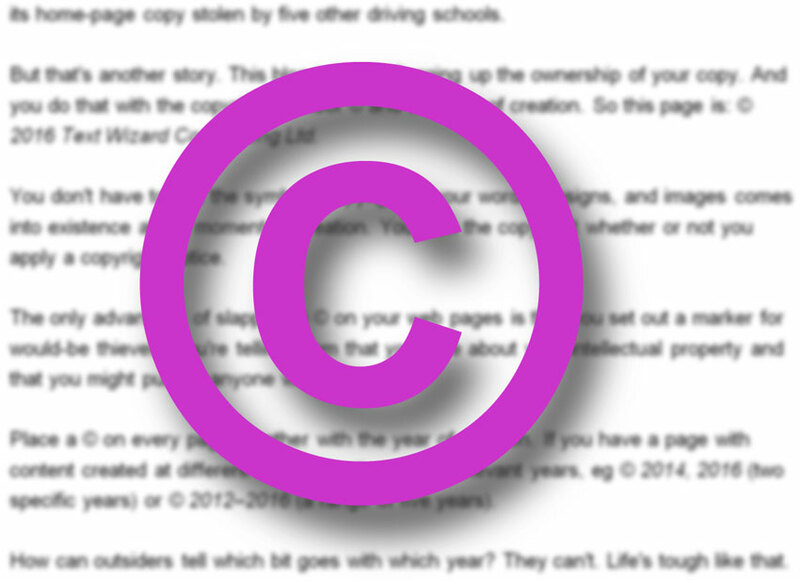 This blog is about flagging up the ownership of your copy. And you do that with the copyright symbol © and the year of creation. So this page is: © 2016 Text Wizard Copywriting Ltd.
You don’t have to use the symbol. Copyright in your words, designs, and images comes into existence at the moment of creation. You own the copyright whether or not you apply a copyright notice. The only advantage of slapping a © on your web pages is that you set out a marker for would-be thieves. You’re telling them that you care about your intellectual property and that you might pursue anyone who infringes it. Place a © on every page together with the year of creation. If you have a page with content created at different times, mention all the relevant years, eg © 2014, 2016 (two specific years) or © 2012–2016 (a range of five years). How can outsiders tell which bit goes with which year? They can’t. Life’s tough like that. One final point: don’t lump mixed-year content under the year of the most recent addition. That’s misleading. Copyright exists for a fixed period of time. By giving older copy a more recent date, you’re claiming something you’re not entitled to. The © symbol is ASCII 169 and Unicode 00A9. For a PC, type alt.